she's using for her first quilt. Do you remember your first quilt? What excitement and pride you had when it was finished. This cute little girl is Ella, and she is learning how to make a quilt in a quilting class at Spring Creek Quilts and Fabrics, which is located in Rickman, Tennessee, a town about 12 miles northeast of Cookeville. In addition to beginning quilting classes Kathy, the owner of Spring Creek Quilts and an accomplished long arm quilter herself, offers a variety of programs including popular Block of the Month (BOM) programs. The shop has been known to have 75 students participating in one of these programs. During my visit, there was a Sit and Sew session in progress. Some students were working on the center of a garden-themed appliqué BOM project. 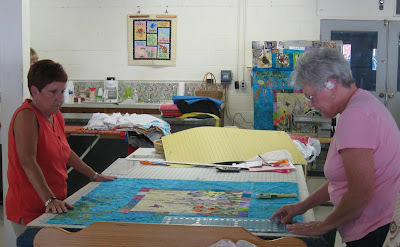 Kathy assists a student with measuring and squaring up her quilt top. 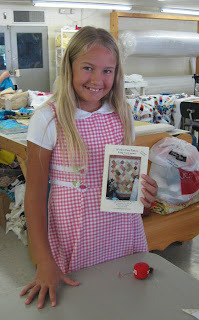 Ella was busy at the sewing machine... carefully piecing 5-inch squares cut from a variety of fat quarters. She is quite the extraordinary fist-time quilter as her quilt top has the blocks set on point! 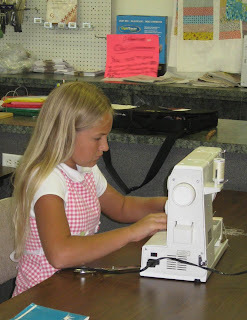 You can see how focussed she is sewing those quarter inch seam allowances. Ella piecing her quilt blocks. 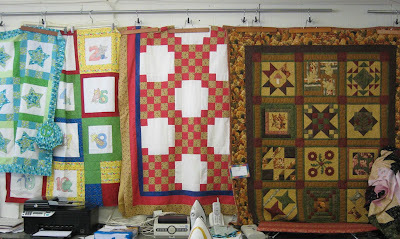 Kathy has been machine quilting for nearly 24 years and offers this service at the shop. 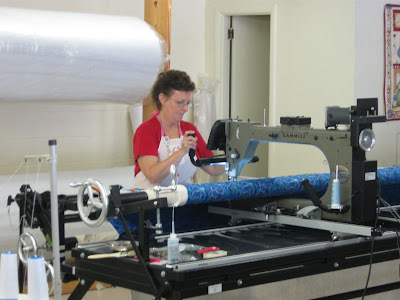 The long arm Gammill machine is set up toward the back of the large main room and is kept quite busy, Kathy indicated. Quilting services are offered at the shop. 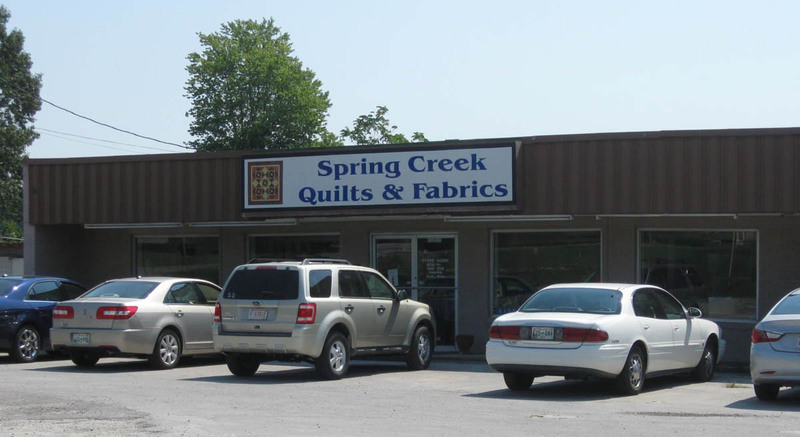 Spring Creek Quilts recently relocated to its current location and is a gathering place for new and long-time sewers and quilters alike. 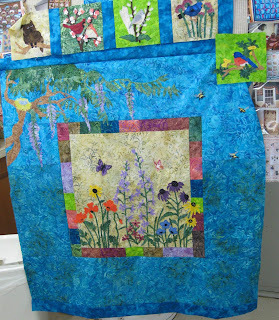 Applique Block of the Month program. Kathy provides a warm and friendly atmosphere for all who visit her shop. She is generous with her knowledge and assistance to customers. Her classes and programs offer fun, interesting and beautiful projects and she guides students and nurtures their creative spirit while they hone their quilting skills along the way. 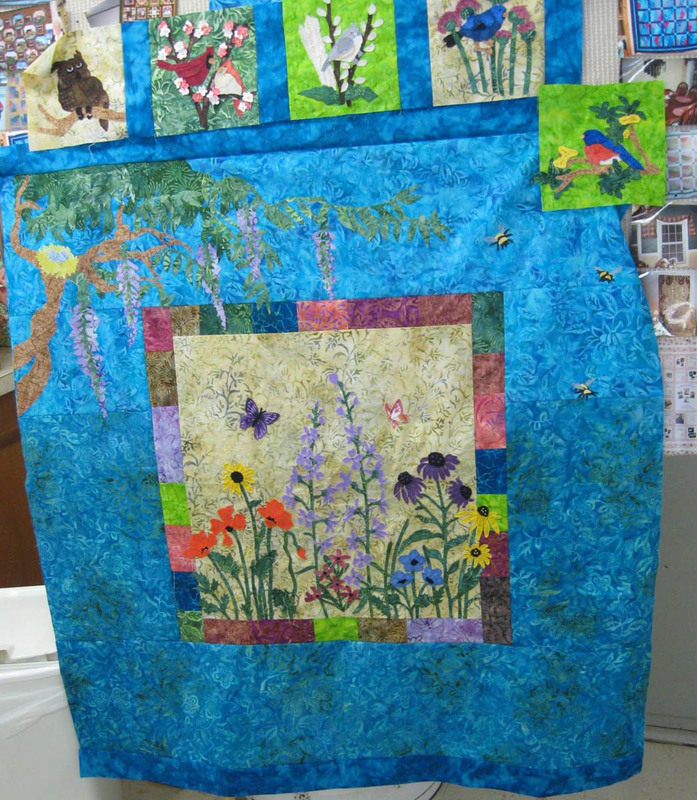 Quilts from various classes and Block of the Month programs. Spring Creek Quilts and Fabrics, Rickman, Tennessee.